The Winter bank indicator is a simple instrument that works purely as a bank ball similar to your spirit level. However the excellent craftsmanship turns this instrument into another Winter masterpiece. Maybe you have a panel space to fill or you are looking for an additional reference point for flying. 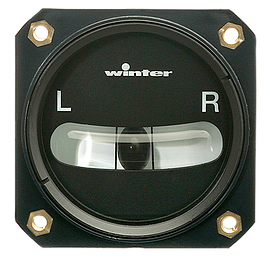 This Winter bank indicator has been designed to fit into a standard 57mm instrument hole mounted from behind the panel. It looks great and has the exact same measurements as the electric turn and bank indicator. It can therefore be removed at a later date without the need for any panel alterations.